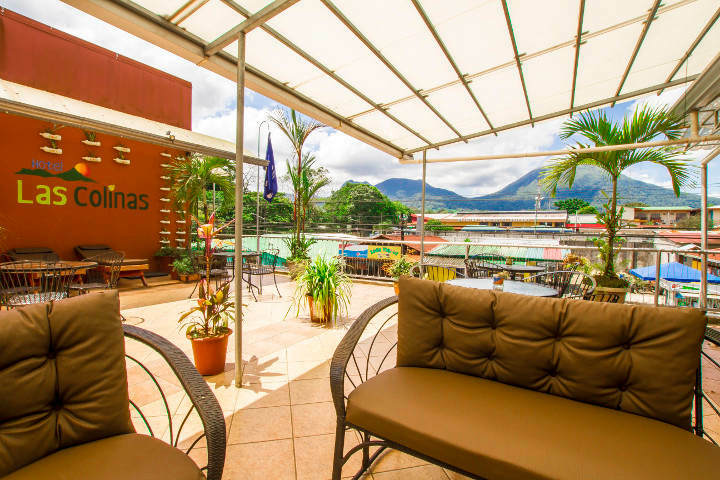 Located in the heart of the village of La Fortuna, with all the facilities of a small town and facing the impressive Arenal Volcano, the location offers walking distance to some of the tourist attractions and services of the area, like La Fortuna Waterfall, local hiking’s, restaurants, souvenirs and banks. Everything without losing the charm of the daily life of a Costa Rican town. This Eco-Friendly hotel is certified with 5 levels in Sustainable Tourism with a 100% of Sustainable operation, and also has been awarded with the Blue Flag Program with actions to tackle climate change. It is also a Carbon Neutrality hotel and Participates in national programs such as Pro Parks Foundation, and International as verification of Rain Forest Alliance, BUN-CA, signed and implemented the Code of Conduct and has its own reforestation project with the possibility to pay the Carbon footprints. •10% discount during Christmas, End of Year and Easter. •2x1 drinks in the Coffe-Bar La Terraza. 150 meters South of BNCR, La Fortuna SC, Costa Rica.